Los Angeles, CA County District Attorney Steve Cooley is the Republican candidate for California Attorney General at a time when government corruption is raging in Los Angeles County. Over the two decades the D.A. 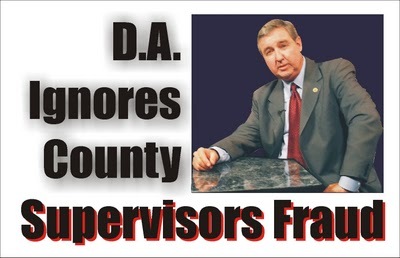 's office has paid scant attention to major public corruption in the County. In fact when Cooley ran for third term in 2006 was at the time when Judicial Watch filed a 2006 lawsuit against the County (Sturgeon v. County of L.A.) regarding $300 million in illegal payments made to the State Superior Court Judges who were forbidden by law to accept the money. Cooley's campaign challengers in 2006 claimed he was not prosecuting major corruption and questioned his ability as a prosecutor. Watch this 8 min video preview . And, at the same time Mexican drug cartels were moving in to take over cities in Los Angeles County, Watch this short 2006 video featuring LASD Sgt. Richard Valdemar, a 33 year veteran gang specialist describe how the cartels take over the city politics. Yet, Cooley was reelected with the financial support of the political establishment that controls L A County government. DISTRICT ATTORNEY PROTECTING COUNTY SUPERVISORS? A request for investigation was sent by Full Disclosure Network Producer Leslie Dutton and free lance reporter Janet Levy regarding the May 2010 Washington D.C. Meetings of the L. A. Board of Supervisors that were posted as official public meetings denied access to media and the public. Watch the Full Disclosure ten minute video report here showing how the media was ejected from the meetings . When Cooley failed to respond to a July 5, request for investigation Certified letters were sent. See signed postal receipts showing receipt of the requests dated July 6, 2010. To date no response, not even a phone call has been made from Cooley's office or the Office of Public Integrity. County Executive Office and L A County Counsel have been slow to respond to the Public Records Act requests for documents and expense reports for the Board meetings that involved travel expenses for the Supervisors and dozens of county employees and department heads. To date no budgets for the elaborate two-day ten-meeting schedule has been produced. Instead a few incomplete expense reports have been forwarded the details of the intensive lobbying sessions with the U S Senators, Members of the House of Representatives and the White House have yet to be disclosed. TINY CITY OF BELL v. L.A. COUNTY GOVERNMENT FRAUD? Steve Cooley’s highly touted public integrity unit aggressively investigating the tiny City of Bell for exorbitant salaries and pensions for the City Manager, Assistant City Manager, Police Chief and Council members. His investigation has raised the public consciousness and demands for government transparency. And yet, the City of Bell's corruption looks like peanuts compared to what is happening in Los Angeles County Courts and the Board of Supervisors. The historic 2006 case filed by Judical Watch public interest legal organization in the Sturgeon v. County of L.A. case became State Law and held County payments to State Judges (approximately $300 million) were illegal. Knowing this, Cooley failed to investigate and prosecute the L A County officials who quickly moved to get legislation through Sacramento giving themselves and the Judges "retroactive immunity from criminal and civil prosecution" in an attempt to legalize the payments at a time of fiscal crisis in California and the Courts. Those payments are continuing to this day despite the Sturgeon ruling that held legislation Senate Bill SBX2 11 did not legalize the payments. Judicial Watch is pressing for an Court Order to stop the payments and should be resolved in the California Court of Appeal this fall. COOLEY IGNORING COUNTY VIOLATIONS OF OPEN MEETING LAWS? Because the District Attorney's office of Public Integrity has not responded to the requests for investigation, it appears the County Board of Supervisors and Executives are going to get another pass from Cooley's administration. And the Board’s violations of California’s Brown Act, are likely to continue. California’s open meeting law mandates public and media access to official meetings, except where litigation is being discussed. And Cooley aspires to higher office? This story disgusts me. If Cooley refuses to do his job, L.A. needs to find someone that will. The old boy's club in L.A. must stop and those responsible for the corruption should be jailed. Vote them out. LA is just one big cesspool of political, and judicial turds. And look at the losers we get to choose from in the upcoming "election". What a joke.